The Standard Over-the-Ear Cannula's flexible, contoured lip tab provides a high level of comfort and stability without excess pressure or pinching. In addition the standard cannula tips deliver oxygen therapy directly into the nostrils without excessive facial contact or irritation. Each individually packaged Standard Over-the-Ear Cannula includes a Star Lumen Supply Tube that is crush and kink-resistant to ensure an uninterrupted oxygen flow. 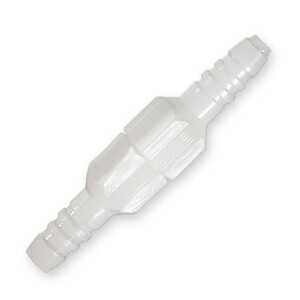 A standard oxygen connector end on each tube ensures easy attachment to most oxygen tubing. I am on 4+ liters of oxygen and this cannula is wonderful and so is the flanged one!! I am new to oxygen use other than with my bipap machine. The canunulas provided for me don't have the tabs under, have shorter nares and the nares are curved too much. These are much more comfortable. The tubing is thinner and so are the nares. They fit better in my nose and the angle toward the center and very little curve make them feel more natural for the air flow. It is lighter weight as well. I am glad I bought 5 of them and will be back when I need more. Also worth mentioning that the 7 foot length allows me to set the portable concentrator on the floor of the car and use both hands to stand up without having my nose yanked. No more feeling like a dog on a short leash! The reason for a 4/5 is the odor which takes a while to dissipate and they are packaged curled so tightly that it takes quite a while to stop trying to coil up. I used to get cannula with a tab from my local provider. They switched to a less expensive style without the tab and I disliked them immensely. They would slide around, come out of my nose etc. Now I have these and everything stays in place even when I turn over multiple times. Fast shipping and securely packaged. I will purchase again. I have been buying this brand for 2 years now. I am lways surprised at how comfortable it feels on my skin, and the angle of the tubes is perfect to not cause nasal sores. I would recommend this brand to anyone on O2 and Direct Home Medical as their source to get the goods! The only Cannula I will use from now on. Comfortable and stays in place! Others I tried hurt the back of my ears and never stayed in place. I love these and will buy again from this seller! Just what I ordered. Easy. Thank you. I love the cannula with the soft tubing ! BEST Cannula EVER. The Tab Makes it Great!!! I've been on 4 liters of oxygen for over a year and have tried and used many styles of cannulas, some good, some bad. This cannula is, by far, the best I've ever used. The part that goes in the nose is a good length so it doesn't just pop out. If it were too long for your preference you could just trim a tiny bit off but I like it this way. I feel like the oxygen is getting further into my nasal passages Probably the best part is the little tab right below the nasal piece. It's soft plastic, crescent-shaped that sits right where the bottom of your nose meets your face. See the pictures below. That little beauty does a really big job. It keeps the cannula in your nose. It keeps it from moving around in your nose, wiggling around in your nose. I have had some that I fiddled around with all day because it was always getting out of place. It also keeps the cannula from rubbing that part of your nose and making it irritated. The little plastic piece is very soft and has no corners. I was given a cannula last week at my lung doctor office, it had a tab on it but it was rectangular in shape with corners and the plastic was harder than this one. After using the one from the doctor for a few days, the spot where it met my face was red and irritated and uncomfortable. This cannula does not do that at all I've seen other reviews mention a smell from the cannula. Every new cannula I've used always has a slight smell because it's been packaged in a plastic bag for who knows how long. This had a slight smell too for just a very short while. But the smell dissipates within minutes and not noticeable at all in a very short time. If the smell bothers you, maybe you could attach the cannula to your concentrator and let it run for a few minutes before you put it in your nose and maybe smell would then be done when you start to wear it. I've just never been bothered by it because it's gone so quickly. My only request would be that I wish we could get this in the 4' length and the shortest length we can get here is 7'. The 7' is OK when using this at home with my big concentrator but when I go out with my POC or if you use small oxygen tanks, the 7' length is too long because I've tripped over it. I'm only 5' so the tube is longer than I am. So when I walk with the 7' tube I have to make sure I loop it a bit. The 4' length is perfect and I don't trip over it! I've seen other reviews wishing for the 4' length also. I have tried several styles and find these more comfortable. The ones provided by my oxygen company have short pieces that extend into the nose and keep falling out. The little tab on the bottom keeps it from twisting and falling out. Yous ordering system makes ordering very simple and delivery is very fast. could not keep regular cannula in nose without tape until I got this type. Works well as presented, long cord. 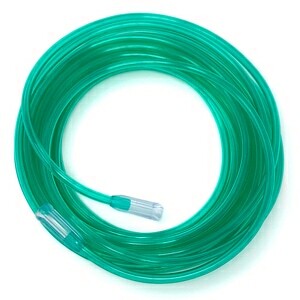 I like this tubing beacuse it is soft and it has the tab which keeps it in place. Thank you Direct Home Medical! I purchase these out of pocket because they are far more comfortable than what's sent to me. I don't have to "fight" it from rolling on my face. Easy ordering and delivery for a quality product. Thank you. your service was very good and saved my running around looking for this item. Excellent price,quality ,and fast shipping.Not to mention it was free !! Some other cannula bother my ears, these do not! 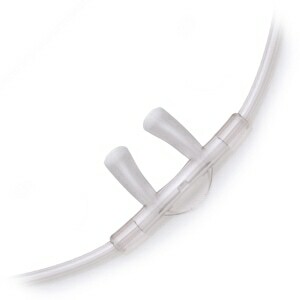 I like this cannula for use with the large concentrator I use at night....it stays in place because of the little tab. 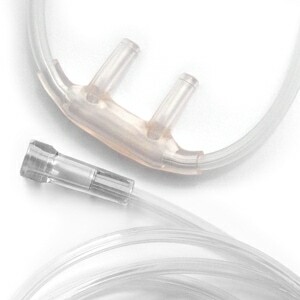 However, when using this cannula with the mini portable tank the tubing attaching to the unit was too flexible, it crimped, and cut the oxygen supply off. Oops, it took a few seconds to track down the culprit. If it came with a more stable tubing I would give it a 5-star. The cannula "whistles" and as I use it at night, it is very disturbing. Can't understand why it should do so, but it whistles at the nasal outlets. We got what we ordered fast. No problems with ordering or the order. This canula has a lip tab that helps keep it in place. I could not find this in any of the local supply stores. Without this tab, the little tubes irritated in the inside of my husbands nose and caused it to bleed. The only problem was the odor. my husband complained of the odor and said it gave him a headache. After airing it out for a full day, the odor was gone and there have no other problems. Great price!! After my mother got dentures, which aren't worn while sleeping. She was having a terrible time keeping the nosepiece in place throughout the night. This particular cannula has a small tab that rests, gently, on her upper lip. This feature keeps the O2 flowing as it should all night long, into her nostrils. A great product for denture wearers! the cannula is very comfortable and exactly what I was looking for. I will be ordering again. The nasal tips are soft and comfortable. The tubing length is good for mobile oxygen. This model has a little addition tab under the nostril tubes. Makes all the difference in comfort of wear. Price is the factor in my way of buying! 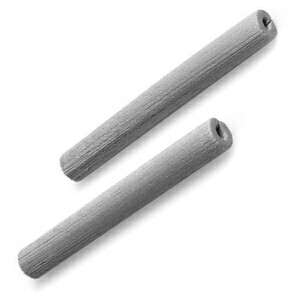 I can recommend to others in buying medical accessories to try your store! The ones I had searching for! I had been searching all over for this style cannula and was so happy when I opened my package and there it was. It is so much more comfortable and efficient than any others I've tried. The low price and speedy delivery was just frosting on the cake. Thanks! I like this type very much as the nasal part of it fits inside the nose better and stays there. The other ones that I had would move during the night and come out of the nose. Best one so far, love it and great price. The company I get my oxygen from has big hard nose tubes which are very uncomfortable, thanks for your service. I ordered the Hudson RCI nasal cannula. I received my order ith in two days and found the cannula to be comfortable because the nasal prongs are thinner and softer than the ones provided by my oxygen company. The cost for this item is very reasonable. Item arrived quickly. Price is unbeatable. These are the ones that are most comfortable to me. I hope I can always get them. My mom prefers these over other cannulas because they have the little flap to hold it in place. My mom's oxygen company stopped carrying them, so I was so glad to find them here and at such a reasonable price. Shipping was super fast and well packaged. Just what I needed. Right size and right length. The slimmer nose cannulas' are a much better fit and much more comfortable that the others I was using. These cannula work very well. Was looking for cannula with a longer prongs and not as curved as the ones I had been using. A+ product and great price! Thanks!! Hard to explain, but I'll try. I was in the hospital and when I started to feel better I realized how comfortable the nasal cannula felt. The way it is designed it stays in place under your nose, doesn't move back and forth under your nose. It is softer and the facial hose is smaller around. My oxygen company do not carry this design, I was so happy when I found it on Direct Home Medical. This is the softest I have found and the type I always get. I am very happy with my purchase. They have the tab below the nose to keep it in place. This is especially helpful at night. This is the cannula my wife needed, small to fit her and comfortable. never run-out of oxygen tubing! This was a very good deal for the price of these oxygen tubings. My 2 new puppies kept thwarting me and chewing up my hoses and then I didn't have anymore, which I really needed. So I found this offer and couldn't refuse. Now I will never run-out. I have a bountiful supply, and the price was great! Thanks! I really like this Nasal Cannula as it has a small flap which allows it to stay put..it does not slide down onto my lip. It is also softer than what I had been using.. The price is what caught my eye and they are adequate, just a clean odor to decrease before using. Product was as promised with fast delivery! Thank you! No one in my area sells the canulas with the lip and that's what I need for it to stay properly placed. Your cost is low and service excellent~! Well pleased with the items & the speed of the shipment. Thank you. My mom has a difficult time finding cannulas that fit her narrow nostrils. They are usually too wide or too short or the feeder tubes are too narrow for 5 liters of oxygen. These are longer and small and allow for the 5 liters of oxygen that she requires during activity. Plus you can't beat the price!! My original supplier started carrying the soft cannulas only. The soft cannulas get twisted and the prongs are not long enough. I am very pleased. I change once a week so I keep plenty on hand. I like this very much. Its easy to put on and it isn't stiff around the ears! Really like how this fits in my nostrils and it is the only style that feels comfortable for me. Good Quality cannula. Has a plastic smell initially which disappears after a while. The part of the cannula that fits into the nostrils are a little sharp but because of the slim design are ideal for people with smaller nostrils. I finally found the exact type, and brand I have been looking for in Cannulas. Fast delivery also. Very satisfied. the canulas came as dvertised and rrived within 3 days. This product is much more comfortable then the one a receive with the oxygen. Great service and short time to receive in mail. The Over-the-Ear Nasal Cannula is much more comfortable! My dad is so much more comfortable with these lip rests.